Addi - Quirky Little Weirdo or Potential Superstar? My flying pocket rocket ? 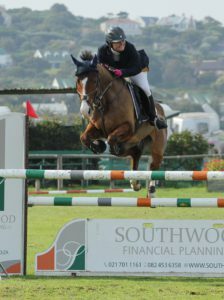 according to SASJ records he is the first Southcross to go 1.20m which makes my heart burst even more! Who would have thought that this little horse had this in him? Quirky little weirdo. I am in awe every day. If someone told me 4 years ago we would jump and complete a 1.20m course I’d tell them they were crazy! I pinch myself every day because he is a dream come true. I am also proud of myself… 18 years since I last jumped this big. After being told I wouldn’t be able to due to a bad fall and working hard on getting strong again… now to keep at it. Thank you Beryl for your ongoing support. Addition and I will keep flying as a proudly sponsored horse!